This week has been really productive because even though I am not 100% on track with my time plan I am quite confident that I will be able to get everything finished on time. Due to the fact that this time last week I was still fretting about my style guide website I am quite happy that I have been able to get this finished on Wednesday morning. This was a huge weight of my mind as I was anxious to get this out of the way so that I could finally focus on the CD design. If I were to do this assignment again I would definitely try to get the website finished during our three week break so that I could go straight to working on the CD for the run in to the deadline. On Wednesday afternoon I was able to develop ideas and create designs for pages 1 and 4 of my CD booklet this week. I was a little apprehensive about this task because I have never done anything like this before and I found it quite a challenge at times to create designs that I was happy with. It was also quite difficult in some instances to find relevant images that accurately matched my ideas and were of a high enough quality to use. This was something which I spent quite a lot of time on but I feel that this was advantageous as I now have a set of images that are suitable for my ideas. If I were to do this again I would definitely spend time researching and gathering accurate images before making any designs because it is all good having a great design but if you cannot find a particular image it will never be made. Below is the design for pages 1 and 4, I have not created any of the text yet but I would welcome any comments you may have. On Thursday I was again focusing on the design of the CD and after ironing out several problems I had with pages 1 and 4 of the booklet I was able to start designing for the inside of the booklet (pages 2 and 3). I found this to be quite difficult to design as there was only a very minimal amount of text that needed to be fit onto one of the two pages which meant that you had to think of other ways to make a visual impact. After creating several roughs and developing them I decided to stick with a similar theme to what I had used in pages 1 and 4 by using the same background to ensure consistency between designs. I am quite happy with the designs that I have come up with for my booklet because I don’t really have any experience with Photoshop apart from the photo restoration that we did previously in the course. Below is the design for pages 2 and 3, I have not created any of the text yet but I would welcome any comments you may have. As we are now fast approaching the deadline I am aware that I have still got quite a bit to do but I feel that by this time next week I will have got my CD completely finished which will leave me in quite a good position. The remainder of my time will then be focused on my evaluation and pre-flight documentation which will then result in everything ready to be handed in! 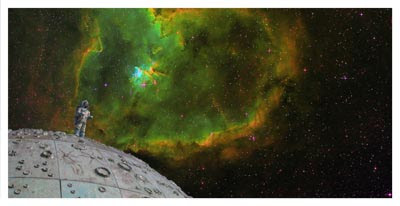 I like your design especially with the space man on the moon. I think the text would look good in the bottom right corner of page 3. The front cover also looks much better without the railing blocking half of the background. I hope to be at the same stage as you by next week. I adore that first image Ben, with the big binocular things you see at the sea side (what DO you call those things?). I was wondering though, what processes did you go through to create this image? Were you lucky enough to find the image like that, or was it an image of space and and image of those binocular things separate? Looking good though so far, looking forward to seeing the final product. Yes I was thinking about putting the text on the bottom right hand corner but it depends how clear the green effect prints out due to CMYK printing quality with green. It is something which I will have to experiment with. 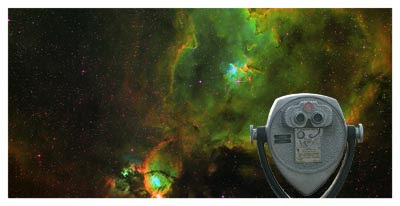 I am not really sure what the real name for those binocular things are but I found them when I typed in telescope on a royalty free image site. The images were seperate and the binoculars were on a balcony overlooking a city so that took quite a while to cut out!